Foundation chain - make this the size of your own wrist. For me, ch 20 was perfect. Join with sl st. Ch 2, turn. HDC around, join with sl st.
Rounds 2-4: ch 2, HDC around, join with sl st.
Rounds 5-6: ch 2, DC around, join with sl st.
Rounds 7-9: ch 2, HDC around, join with sl st. Round 10: ch2, HDC 3, 2 HDC in next st, *HDC 4, 2 HDC in next st.* repeat between stars around. Join with sl st. Round 11: ch 2, HDC in each stitch around. Join with sl st.
Scalloped edge: ch 2, skip one st., *three HDC in next st., ch 1(skip one st), sc in next st., ch 1 (skip one st)* repeat between stars around until you're done, join with sl st. These are perfect for playing the viola, not getting in the way of quick moving fingers, and still keeping my hands warm in a cold rehearsal hall. :) Enjoy! 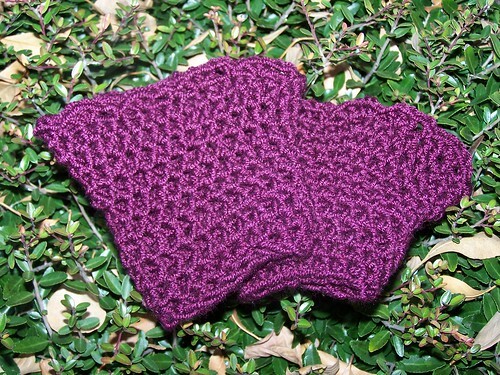 Thank you for the fab pattern- have made these and posted photos on Ravelry! Love it! As a former harpist, I love your photos! Thanks for the link back!